Xenab’s Atelier is a famous Fashion brand of Pakistan. This brand is situated in Karachi, Pakistan. 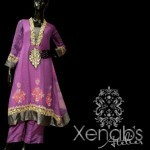 Xenab’s Atelier gives luxuriously and lavishly designed on best fabric of chiffon, silk for women and girls etc. This brand is famous of its main product of lines of Xenab’s Atelier are wedding dresses, formal wear, semi-formal wear, casual wear along with the party wear clothes and have a large variety of clothes of eastern and western mixture for all occasions and events. The modernism and embellish in the clothes have each single time won the heart beatniks of the fashion lovers. 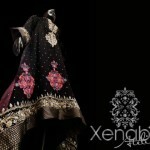 Xenab’s Atelier has launched its latest and beautiful collection for girls. The designer has given now Bridal wear collection for women and young girls. In this collection latest fashion trend of long shirts and Bridal Frocks with heavy embroidery are included. In this collection the designer has given a large variety of Colors and the dresses are looking very charismatic and also best quality fabric has been used. Xenab’s Atelier Formal wedding party Dresses 2013 chiefly focuses on long shirts designs which are decorated with conventional embroidery of stone work, debka work and embellishment which is done around borders of these fashion shirts and around neckline. Let’s See some pictures of Latest Xenab’s Atelier Bridal wear collection 2013-2014 for women and young girls.